Between Halloween Horror Nights and Grinchmas at Universal Studios Hollywood, it’s difficult to think of any other celebration at the park. But Universal is hard at work to create memorable and magical experiences for everyone through the year. The Lunar New Year is no exception! We are huge fans of seeing the melting pot of cultures that represents California on display anywhere and especially our theme parks. So needless to say we are excited to come back to USH to see all the new offerings they have in store for The Year of the Dog! Below you will find the details outlining the fun attraction for their Lunar New Year celebration. 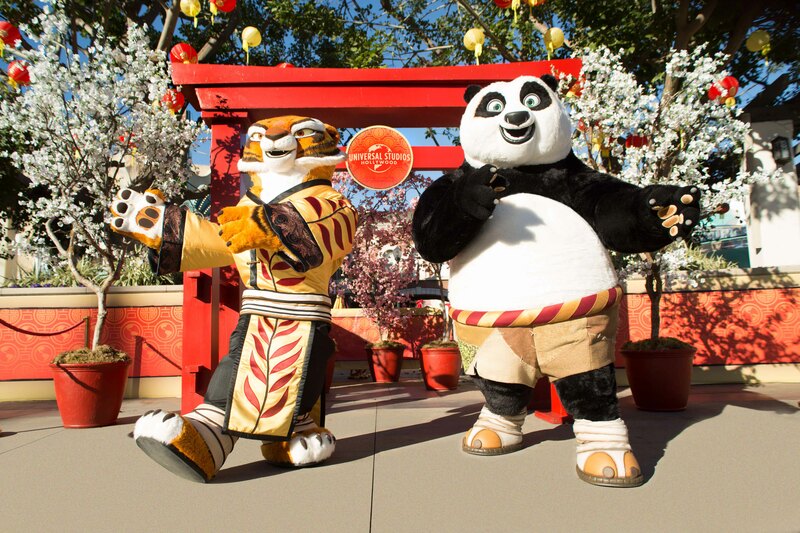 Universal Studios Hollywood welcomes DreamWorks’ Kung Fu Panda masters Po and Tigress to its all-new Lunar New Year event as The Entertainment Capital of L.A. ushers in the “Year of the Dog” from Saturday, February 10 to Sunday, February 25, 2018. Lunar New Year is included in the price of admission to Universal Studios Hollywood. This spectacularly themed Lunar New Year event will take place within Universal Plaza, a polygon-shaped piazza that sits at the heart of the theme park. Under a curtain of customary red Chinese lanterns and stunning plum blossom Wishing Trees, the festivities will come to life as guests discover the 12 zodiac animal signs accompanied by their symbolic attributes. New to this year’s celebratory event, Universal Studios Hollywood will debut the all-new DreamWorks’ Kung Fu Panda Jade Palace Performance Stage and the exciting Dragon Warrior Training Show based on the beloved Kung Fu Panda franchise. The all-new Kung Fu Panda experience will engage guests of all ages in an interactive martial art demonstration performed by Master Po and friends. The immersive event will also feature veteran DreamWorks animators who will demonstrate practical techniques of drawing their favorite Kung Fu Pandacharacters as keepsake mementos. As a complement to this year’s Lunar New Year celebration, Universal Studios Hollywood will welcome Hello Kitty, the beloved global pop icon created by the renowned Japanese company Sanrio to the entertainment destination. Hello Kitty and her signature red bow will make special appearances to meet guests at the Hello Kitty Shop located within the new Animation Studio Store opening Spring 2018. Year-round, Universal Studios Hollywood’s signature Studio Tour offers guests a revealing look at an authentic movie and television studio in select languages, including Mandarin. Expertly-trained Mandarin-speaking tour guides provide insight into the world of movie-making magic as guests enjoy a front row seat and behind-the-scenes access to one of the largest production studios in the world. In-language park maps are also available for guests. Guests can also celebrate the spirit of Lunar New Year at Universal CityWalk’s Dongpo Kitchen restaurant featuring upscale and modern Sichuan cuisine. Inspired by China’s premier restaurant Meizhou Dongpo, Dongpo Kitchen offers the comforts of a casual dining environment with both indoor and al fresco seating and caters to an eclectic palate with a variety of signature dishes.